How many times per day should you brush your teeth? You should brush your teeth twice a day – in the morning and last thing at night, before going to bed. Is it really necessary to floss every day? It’s essential to clean in-between your teeth every day, either using floss or another interdental tool. Brushing only cleans three of the tooth’s five surfaces. In-between the teeth is one of the most common places for cavities to start. If you find using traditional floss difficult, find another interdental method that suits your mouth and lifestyle. 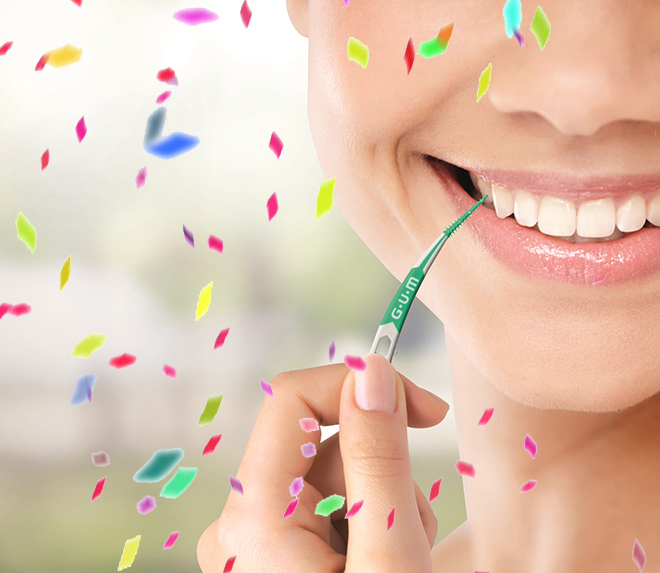 Sunstar GUM has a huge range available – including GUM Soft-Picks (tiny rubber toothpicks) and tiny interdental brushes. You could also use a water-based interdental cleaner such as the Philips Sonicare AirFloss or Panasonic Oral Irrigator. If you’re unsure of how to floss correctly watch these videos or speak to your dentist or oral hygienist. They can also advise you on which tools to use. Are at-home bleaching treatments safe? There are three options for whitening – over-the-counter products; professional at-home whitening and professional whitening at a dental practice. I recommend and prefer professional teeth whitening products, because I know they are safe and effective. Some over-the-counter whitening products are abrasive, can damage the teeth and cause sensitivity. The results may not last long. Professional at-home whitening kits can be safe and effective if done correctly, but it does take time. I find professional whitening at the dental practice is safe, effective and the quickest method. Are there any foods / drinks that should be avoided for the health of our teeth? Cavities are caused by bacteria in plaque (streptococcus mutans) that thrive in an acidic environment. Eating sugary foods and drinks makes the mouth more acidic, feeding this ‘bad’ bacteria, which then – if not removed by brushing, flossing and rinsing – will eat away at your tooth’s enamel, causing decay and sensitivity. Foods like toffees and dried fruit can stick to the teeth and are not great from an oral health perspective. Rather eat a nutritious, healthy diet with plenty of calcium and Vitamin D. When you do occasionally indulge, don’t brush immediately, as the sugar will have temporarily softened your tooth’s enamel. Rather rinse with water or an alcohol-free mouthwash, like Dentyl Dual Action, and wait an hour or so before brushing. How often you eat is sometimes more important than what you eat. From a dental perspective, a brief fluctuation in pH balance at mealtimes is better than a continual bombardment from constant snacking. Regular meals or a once-off indulgence will be better for your teeth than eating small snacks and treats throughout the day. Absolutely, if you are chewing sugar-free gum with xylitol; it can actually be good for your oral health. Xylitol can help reduce plaque formation and chewing gum stimulates saliva flow, keeping the mouth cleaner for longer. Don’t chew gum that contains sugar. What are your top tips for a healthy mouth and teeth? Always use a soft-bristled brush – softer bristles reach more areas and clean much more effectively. If possible, buy an electric toothbrush – they are the best! I recommend Philips Sonicare or the new Sunstar GUM ActiVital sonic toothbrush. Change your brush, or brush head, at least every three months. Clean in-between every day – find a tool that suits you – or ask your hygienist to help. Have a professional clean with an oral hygienist every 6 months and see the dentist at least once a year. Prevention is always better than cure. Dirna Grobbelaar, Ivohealth’s Oral Care Advisor, qualified as an oral hygienist at the University of Stellenbosch in 1999. She uses the latest technology at her practice – Intercare in Durbanville, Cape Town – including EMS, an ultrasonic Piezon Scaler and Airflow precision. Dirna is passionate about oral health and well-being. She keeps up to date with patient concerns, technology and trends. She completed her Guided Biofilm Therapy training in 2018 and is accredited by the Swiss Dental Academy. How often do you visit your dentist? Have you found a routine that works for you? Tell us in the comments section below.